Gabe Gabrielle has been at Kennedy Space Center as a contractor for NASA as an Engineering Programmer for approximately 17 years, a member of NASA’s Disability Awareness And Action Working Group, improving the work environment for personnel who are differently able, and a member of NASA’s Speakers Bureau for the 10 years. His position as an Engineer Programmer was such and amazing experience as his job was to identify solutions for repairs to bridges, roads, mechanical systems, roofs, elevators, and any environmental issues. The greatest part of this was it gave him access to everything on KSC - Launch Complexes, Launch Control Center, Vehicle Assembly Building, Orbiter Processing Facilities, Space Station Processing Facility, Mars Simulation Testing Area. NASA and Kennedy Space Center are simply magical…I vividly remember my first shuttle launch…the excitement building day by day as the launch countdown progressed…shuttle “days to launch” signs around the space center…the seven astronauts coming from Houston, Texas…each piloting their NASA jet, then preparing for launch…and the launch…the unbelievable sensation through your body of the earth shaking, something in the air that couldn’t be seen or touched but felt...the shuttle rising in an eerie silence as the sound followed getting louder and louder… turning into a roar that rattled windows and set off car alarms for tens of kilometers….then disappearing into a crystal clear blue sky during the day or turning the black night sky into daylight…to go from launch to space in 8 minutes and 32 seconds….spectacular… He learned so much about the astronauts on the International Space Station, Rovers going to Mars, and the future of the space program with astronauts going to Mars. He wanted to share the excitement with kids while promoting Science, Technology, Engineering, Arts and Mathematics (STEAM) to give them better opportunities for careers in math/science and the space program. It is so very important for him to speak about dreams, goals, and enjoying life. He have always had fun, never “worked” while always challenging himself to do my best. He saw so many people constantly complaining, never happy, seemingly only waiting for weekends. 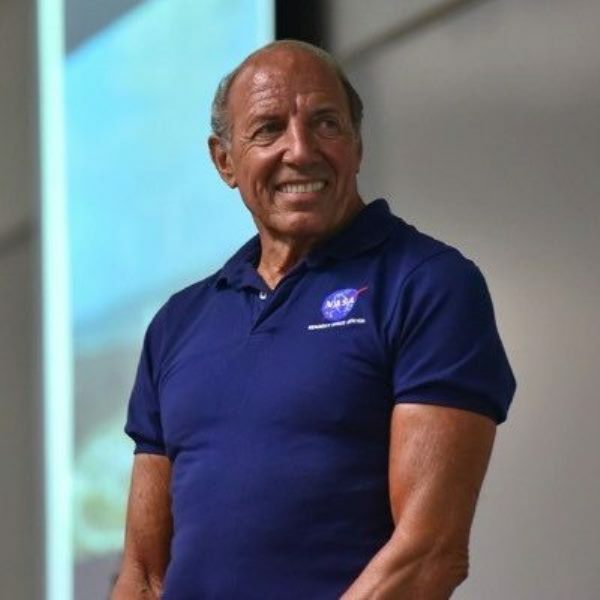 He knew kids were hearing this and wanted them to know it doesn’t have to be this way…so he devised a presentation about the space program while focusing on believing in themselves, turning dreams into goals, understand anything is possible, to have fun and, most importantly to have hope. Gabe Gabrielle is the Former Director of Engineering for the US Air Force’s Special Operations Command. He assigned to NASA’s Speakers Bureau for 10 years. He has visited 350 schools from 2007-2018 throughout the US, speaking to over 55,000 students from K-College. In 2014, he was requested by the American Embassy in Qatar to support a weeklong community outreach on the 10th year anniversary of Mars Rovers. He has visited 185 schools in Norway, Denmark, Germany, Trinidad, Qatar, and Brazil from 2008 to 2018 speaking with 33,000 students. Also, visited South Africa in March 07, June 08, and Oct 2010, spoke to over 8,000 students while supporting both NASA and American Embassy outreach. A member of Kennedy Space Center’s Disability Awareness and Action Working Group (DAAWG) for the past 14 years, devoted to improving the work environment for personnel with disabilities. A 2016 recipient of the Central Florida Aerospace Academy Ray Lien Award for Excellence In Aerospace Education. He is also a sighted guide for a tri-athlete who is blind.